Posted by themidlifesecondwife in Product Reviews, What's the Buzz? Disclosure: I am participating in the Verizon Boomer Voices program and will be provided with a wireless device and six months of service in exchange for my honest opinions about the product. Today is my last day as a member of the Verizon Boomer Voices program. I feel as though I should go out with a song—you know, something by the Verizon Boomer Voices—that great girl group that used to record on the Motorolatown label. (That’s borrowed from a joke I cracked at our dinner in Chicago on the 95th floor of the John Hancock Tower.) Envision 16 midlife bloggers from across the Midwest, dressed in spangley gowns and performing synchronized, rhythmic hand gestures while holding a variety of mobile devices. 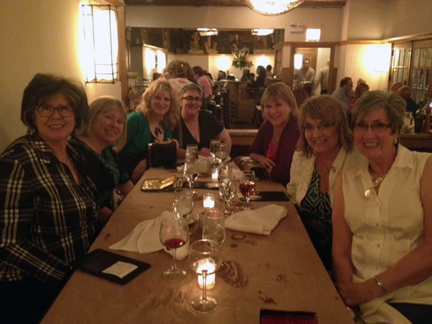 Dinner at Coco Pazzo Cafe in Chicago with some of the Verizon Boomer Voices gang. I’m at the far left. What a ride this was. From those intense training sessions in Chicago at the start of the program in June, to testing the DROID RAZR MAXX HD and the FitBit, to my house party in October, to the finale—my great, big raffle earlier in December—the experience has been extraordinary. I’ve had fun, elbowed my way out of my technology comfort zone, and made a rebellious decision. In June 2014, when my contract with AT&T ends, I’m jumping over to Verizon Wireless. Why? Because it’s a phenomenal company with great customer service that just happens to have the fastest 4G LTE network around. And although I no longer live in Oberlin, Ohio, I still visit my old college town fairly frequently. AT&T’s service there has always been spotty at best. It will be a relief to enjoy social media with my coffee at the Black River Café! Verizon Wireless surprised my program colleagues and me in November by sending us each a Samsung Galaxy Note 3 to test. As you might recall, I fractured my foot around that time; I wasn’t in much of a mood, therefore, to go exploring new technology, especially since I was ingesting some powerful pain meds. Fear not, dear readers. I found a workaround to the dilemma that pleased my husband to no end. 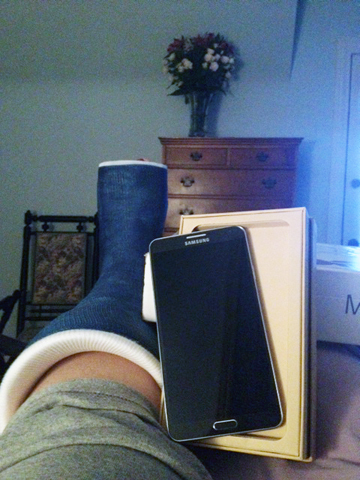 I gave him the device as an early Christmas present, and to thank him for being such an incredible tower of strength and support during my time on the injured list. I think of the Galaxy Note 3 as a phone masquerading as a tablet. John had recently acquired a tablet, but he quickly abandoned it favor of the Note 3. He’s come a long way since the day I first met him, checking his email on his Blackberry. When that conked out, I gave him an old iPhone of mine to use so he could discover the joys of the touch screen. Now, after using the Samsung Galaxy Note 3, he’s an Android convert. He likes the Note 3 better than the iPhone, and certainly more than he liked his tablet. “It offers all the advantages of the tablet, but it fits neatly in my hand,” he says. He also finds the built-in app that allows him to accept Microsoft Office docs “very useful.” If the developers really want to send him over the moon, they’ll devise a way for the Note 3 to launch a new MS Office program. A frequent flier, John often works on the plane; this way, he says, he’ll no longer have to bruise the shins of the unlucky passenger seated in front of him while grappling to remove his laptop from his briefcase. His favorite feature, though, is the snooze button on the alarm. The developers have built-in a small quick-view tab that remains on the left of the screen to allow the user to access folders and other frequently used apps. Because it is always there, the small part of the screen that it occupies covers up areas of games that are occasionally important to see. Although this is a nuisance (I have yet to find a help topic that will allow me to hide it), overall I’m very happy with the Note 3 and plan on making it the only companion to my laptop. For an executive who travels a lot, this is high praise. I want to thank Verizon Wireless for sending me such a fabulous mobile device, thus solving my Christmas-shopping dilemma at a time when I can barely leave the house. I also want to thank them for inviting me to be part of this incredible program. I’ve learned so much, and made many wonderful new friends. To all of them—and to you, my loyal readers—a very Happy New Year! Do DROIDS Dream of Electric Sheep? Do Advertisers Care what Boomers Think? Whad’ya Know About Verizon Wireless? I have had Verizon wireless for several years. They are a great company. You have done a fabulous job as one of their voices. I’m sure they are grateful. It has been a wild ride. The best part was meeting bloggers like you. I am a Verizon customer and will remain so. It is a great company. Cheryl, thanks so much for your comment! I’m so glad to have met you, too. Verizon’s Boomer Voices program really was an exceptional experience, and I’m happy to have been a part of it. Happy New Year!